Is it just me or has 2014 been the biggest, busiest, and most remarkable year we’ve had yet? I don’t even know where to begin with a yearly wrap-up! Surely the 1 July merger with CQ TAFE has been the most profound event of the year. 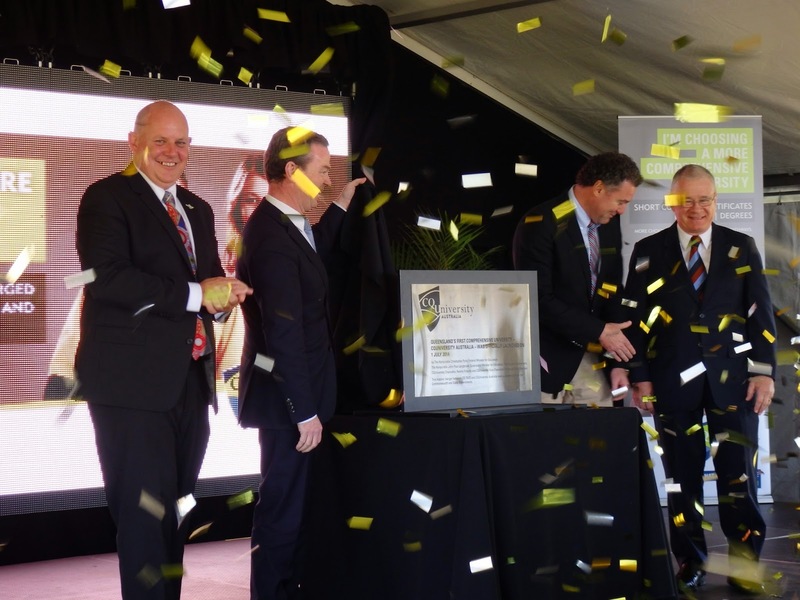 This was a day that not only transformed CQUniversity forever, but the way post-schooling education and training is conducted in Central Queensland. It was also the day we welcomed almost 19,000 TAFE students and 400 incredibly dedicated VET colleagues into the organisation, at the same time becoming the largest regionally-based university in Australia. Let that sink in – we are now the biggest regional uni. And if the merger itself wasn’t a big enough task, around 20 new VET programs were added to our range of offerings in the post-merger period. The effort that went into this was outstanding. We also saw Study Centres open in Townsville, Charters Towers, Perth and Karratha this year, enabling more students to access an innovative model of supportive Distance Education. Our stock just continued to rise across all areas of the university, as did our reputation in the sector. We seem to be one of the universities that everyone is watching at the moment, and its easy to understand why. Our numbers are climbing, our course options are expanding, our student satisfaction ratings are heading north, and our graduation ceremonies seem to be getting bigger and bigger. And lets not overlook the work Facilities Management team have been doing on major new buildings & projects all over our footprint. Our teaching staff have continued to raise the bar of excellence this year. Prof Stephen Colbran, who won this year’s Australian Award for Teaching Excellence in Law, is a great example of the talent we have, but I could just as easily list many others. Likewise in research we’ve seen some great results being produced, and we exceeded our target for total research grants this year. Prof John Rolfe’s involvement in the $31M Tropical Water Quality Hub and Dr Corneel Vandelanotte’s NHMRC funding have been exciting to see, and the outputs of our Early Career Researchers Group this year makes our research future look very exciting indeed. Our international students continue to be a great source of pride, and 2014 was the year we began to see the green shoots of recovery following the downturn in the international market. Our engagement with Indigenous communities and groups under the leadership of Prof Bronwyn Fredericks has been phenomenal. Today we have more than 1,100 Aboriginal and Torres Strait Islander students at CQUniversity, and this year we saw more Indigenous students cross the graduation stage than any other year - something we should all be proud of. Speaking of graduates, our alumni continue to take the world by storm, and its hard to go past the story of former student Carolyn Hardy who won this year’s Distinguished Alumni Award. And how fantastic was it to see our Engineering students win the national finals of The Big Idea competition with their concept of reusing industrial pallets for emergency housing following natural disasters. There are so many things that have made 2014 great (and I know I’ve overlooked many), but my favourite moment of the year? Probably watching Dr Louise Byrne steal the show on ABC’s Q&A program as a panellist. I’d like to thank everybody for their contribution and support this year - I am very proud of what has been achieved. I wish you all a safe and happy Christmas, and a wonderful New Year.